From the outrage over Cappiello's theft of my work for his god-awful, inaccurate hitjob campaign web ad, a commenter over at CTLP has what I think is the best advice for Cappiello. If I may suggest [...] Cappiello should scrap, the crap. Just ask those in the 5th district how much they have enjoyed the past 2 years with Chris Murphy as their representative in Washington? It’s a simple question. If they are happy, why then should the rest of us not be as well? If they are not, they can try to solve their problem in Nov.
Best of all it avoids all sorts of childish games, name calling, and the normal garbage that seems to be, well so normal these days. Geeze, and I thought raising two teenagers to adulthood was complex!!! From the start of his campaign, Cappiello has taken a long-overplayed and boring page from Nancy Johnson's mud-slinging playbook. 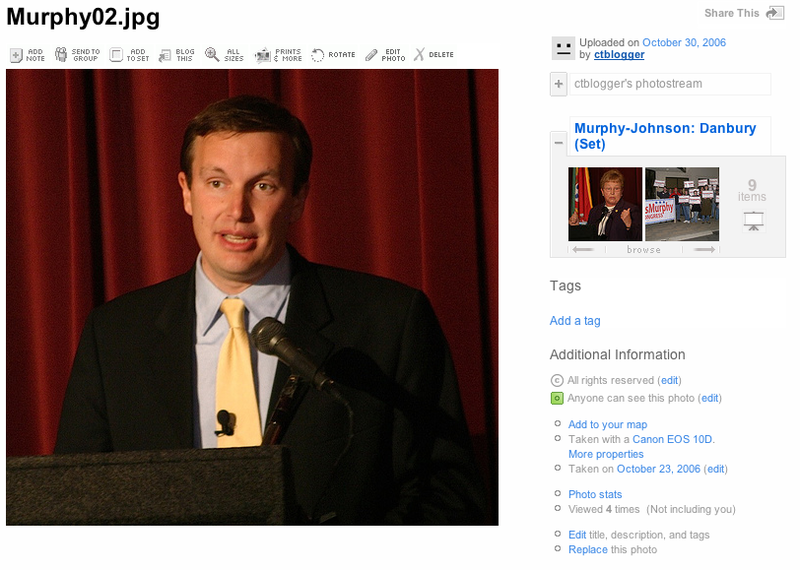 Between the outright lies over Murphy's position such as off-shore drilling, stealing my work for his political purposes (and not doing the minimum in offering an apology when caught in the act), to spending mroe time on the attack and less time offering any real details on his position ON ANYTHING, Cappiello campaign has become a sort of embarrassment for someone who dreams of higher office on the federal level. I thought Cappiello was a bigger person than what he has presented to the public so far...I stand corrected. I think the News-Times is goofing on Galante. On one hand, they post a story on Galante's attempt to cite his charity work as a reason for a light sentence. On the other hand, the photo they use has a guy who looks like the LAST person you'd want to piss off (if you know what I mean). I'm just waiting on the News-Times to release a photo of Galante and Boughton in the box seats at a Trashers game when the state case against Galante involving charges of illegal bundled campaign donations to the Mark Boughton's campaign as well as David Cappiello and Lou DeLuca gets underway. In light on Shays latest attempt to align himself in with Barack Obama, the Obama released the following statement which should put an end to the nonsense. "Barack Obama has strong, positive vision for America and a long record of bipartisan accomplishment, and we are pleased that it is respected by his Democratic and Republican colleagues in the House," said Obama spokesman Bill Burton. "However, in this race, the good people of Connecticut should know that Barack Obama supports Jim Himes and believes Himes is the candidate who will bring the change American families need to Washington." We see this type of bi-partisan garbage every two years from Shays. Hopefully, the resident in the 4th CD won't drink his kool-aid this time around. Statistical analysis of Chris Shays’ votes reveals that when it counts, Shays has been a loyal servant of the Republican Party. On the closest votes—when his vote has the most power to affect the outcome, when the Republican Party most needs his support, and when 4th District residents most need him to make the right choice—Shays has lined up behind his Party’s leadership 89% of the time, or nine out of ten times. This finding—based on analysis of the 1,752 votes cast in the 110th Congress—shows that Shays is not “purple” as he claims, but is, in fact, a true Republican partisan. Real political courage doesn’t mean crossing the aisle when it’s safe and easy; it means exercising independent judgment on the close votes where your decision can really make a difference. The 4th CD deserves better than the status quo. 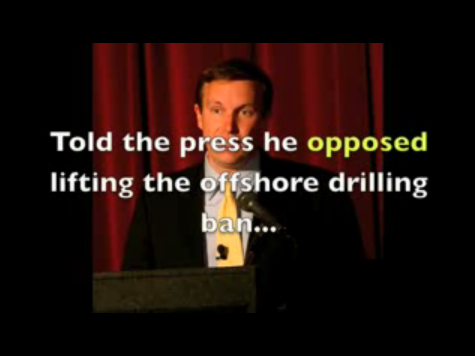 Jim Himes is the answer. This is probably the worse ad I've ever seen from someone running for Congress. In fact, I had to do a double take and make sure this wasn't some type of joke. While in a stake of shock over the sophomoric (if not downright idiotic) nature of the ad, I noticed this photo and said to myself "hmm..., that look familiar?" Then it dawned upon me why the image caught my attention...because I shot the photograph. 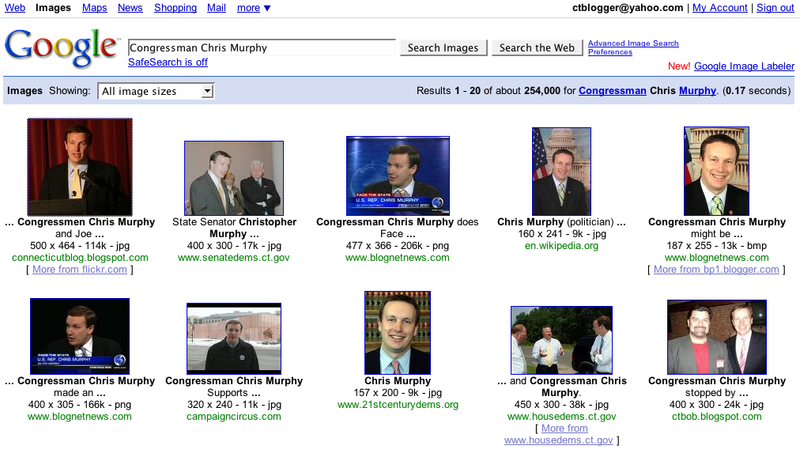 Seeing that the budget for this ad was rather low, and most (if not all the images) in this so-called "ad" were a result of a google image search, it's no surprise that the top-notch Cappiello campaign used my photo seeing that it's the first image that comes up in google after a search for the words "Congressman Chris Murphy"
Now, as it clearly states on my site, "all original video/audio/graphical/text works is licensed under a Creative Commons Attribution-NoDerivs 2.5 License (I guess you didn't see that disclaimer on my sites huh? In layman's terms, if you're going to use an original piece from yours truly, feel free to do so BUT under the condition that you attribute my work and DON'T alter it. In short, it's bad enough that a person running for Congress would put out such a poorly produced ad, it's another thing when a person running for Congress disregards the rights of an individual who simply request that, if his work is used in any manner, that it be attributed to the owner (that would be me). We can go two ways with this. Either re-work the "ad" with an attribution to my site under the photograph, remove my photo from your ad all together (which at this point, seems to be the better choice). You think with all those fundraisers, Cappiello could purchase photographs for his ad. I guess Dave and Mark have something in common after all. UPDATE: Genghis over at CTLP picks up on the story and nails it. “Creative Commons” doesn’t mean “feel free to steal this work,” it’s more an attempt to make copyright more humane and intelligible while allowing artists to spread their work and get credit for it, among other things. The Cappiello campaign shouldn’t have done it. They really shouldn’t have picked one of CTBlogger’s photos to do it with. Look, this is simple. Bloggers like myself and others don't get paid for what we do. I'm not being bankrolled by from 527 or political party. The original photos and videos you see here are done by yours truly and I don't ask for a dime in return (although, I could and probably make a good size a change). All I (and most bloggers I know) request is that your ATTRIBUTE our work...that's it. I've work with several media outlets around the country as well as local papers such as the Tribuna (this site was even cross link in it's entirety by the News-Times back in 2006) and they knew the drill. A political campaign which is focused on a federal office (which has to follow strict campaign rules) should DEFINITELY know the drill. UPDATE 2: It looks like the Cappiello campaign got the message out and clear, removed the ad, and replaced it with a new one with the proper attribution. Hopefully, a lesson has been learned. For a state lawmaker and desires to be federal lawmaker, this clear violation of the law from Cappiello is most troubling and the fact that his campaign has not even offered an apology for this incident is all the more disturbing. You have to be kidding me right?!? Really Chris, you're kidding right? Since Cappiello was spotted filming his TV ad at the Danbury Library recently, I can't wait to see the boatload of silliness he comes out with...hopefully, it will be better than this nonsense (although, watching Cappy's campaign, I'm not holding my breath). UPDATE: Even Chris Matthews is laughing over the ad. (From top left to bottom right. 110th State Rep. Bob Godfrey. Danbury DTC chairman Joe DaSilva and Congressman Chris Murphy. 2nd Dist. State Rep Jason Bartlett. Future majority leader 54th Dist State Rep. Denise Merrill, Bethel DTC Chairwoman Alice Hutchinson and future House Speaker 84th Dist. State Rep. Chris Donavan, 109th Dist. State Rep Joe Taborsak, attendees at the annual clambake). In covering the campaign scene across the state, my next stop in the "campaign spotlight" series was at the Danbury Democratic Town Committee Clambake. 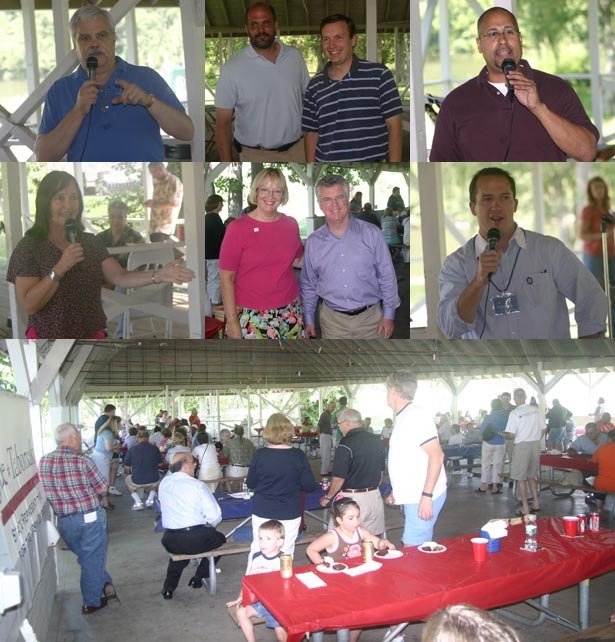 Held at Hatter's Park on the 17th, the fund raiser for the town committee was well attended by supporters in the Danbury area as well as by elected officials and leaders of the State Capitol delegation. Keeping my writing to a minimum, here's by brief video report on the event. 1. State Rep. Bob Godfrey. 2. Local Democrats come out to support the Bethel DTC at annual picnic. 3. Congressman Murphy delights Italian festival crowd. A seven-year tax deferral (which will cost the taxpayers a boatload of dollars" for a project that's nothing more than a college dormitory that the mayor and Republican majority defends (regardless of what they say now). In an effort to make sure that the new optical scanning machines worked properly, today, Secretary of State Susan Bysiewicz ordered the following voting districts in Danbury to be audited. In preparation for the November 4, 2008 General Election and to ensure Connecticut’s optical scan voting machines are working accurately, Secretary of the State Susan Bysiewicz has ordered the primary results of one-third (1/3) of the voting precincts used on August 12, 2008 to be audited. Sec. Bysiewicz was joined by voting rights advocates and elections officials from across Connecticut at a news conference at the State Capitol on Tuesday August 19th to randomly select the voting precincts which will have election results audited – as required by Public Act 07-194, An Act Concerning the Integrity and Security of the Voting Process. The audits can begin no sooner than August 27, 2008 and must be completed by September 10, 2008. Let's be clear here...the audit is being done NOT because there was a problem with the optical scanning machines. The Secretary is doing an random audit to make sure there was no problem with the machines in general. This is nothing new as Secretary Bysiewicz has done audits after every election since the start of the use of the new machines. It's that this is the first time the machines in Danbury were selected to be audited. 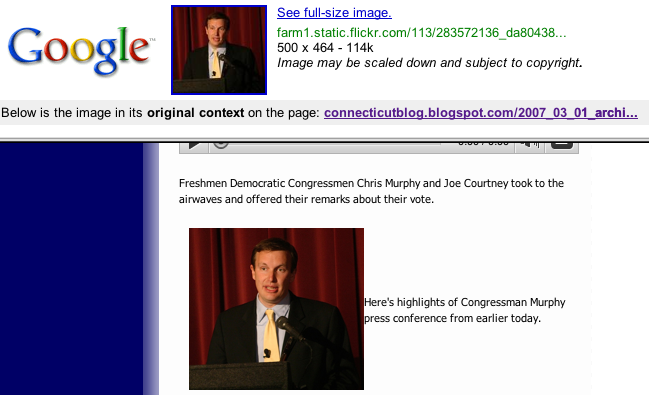 Usually, CT-N cover the audit press conference and if they did, I'll catch it and post it at a later date. In my reporting on the idiotic attempt to give away city owned land to Dr. Fry, I forget to mention two other Republicans who deserve credit in their attempt to push this deal through. It was 3rd Ward Councilman Cavo who seconded 3rd Ward Councilman Caladrino's motion to APPROVE THE AD-HOC COMMITTEE REPORT. If you MAKE A MOTION or SECOND the motion to TO APPROVE A REPORT, to usually because you approve of the measure so much that you have no problem bringing it to a vote. This is EXACTLY what 3rd Ward Councilman Caladrino and 3rd Ward Councilman Cavo meant when they made and seconded the motion to APPROVE the ad-hoc report. Why would 3rd Ward Councilman Caladrino and 3rd Ward Councilman Cavo make a motion to approve the ad-hoc report's recommendation THEN turn around and vote against the same report? Why was 3rd Ward Councilman Caladrino in such a rush to make a motion to approve the ad-hoc report (before the report could be read into the record) given the history with the land in question and knowledge of the public's past opposition to the deal? Why would 3rd Ward Councilman Caladrino know about the public's past opposition you ask? Why because the land in question...84 Hospital Ave...THE 3RD WARD...you know, Cavo and Caladrino's WARD! Why, after seeing the overwhelming negative response from the other council members, didn't 3rd Ward Councilman Caladrino simply withdrawn his motion? Here, I'll get to the obvious. Althogh was NO input from the Director of Public Works and Traffic either at the ad-hoc committee OR at the council meeting that night, they (the Republicans) brought this item to the floor anyway. Along with being a TEACHER, Seabury is also the MAJORITY LEADER of the Common Council. He's been around long enough to know about the past attempts by Dr. Fry to acquire this land and the disapproval from the council in regards to giving this piece of land away so WHY did he approve the ad-hoc report AND vote in favor of the deal WHILE stating during the ad-hoc committee that he doesn't recall a time ever when the council went against the recommendation of the Planning Department (who disapproved of the deal)? Mr. Knapp stated the charge of the committee was to consider a request to lease land located at 84 Hospital Ave. Mr. Knapp said the report from the Planning Department was negative and asked Mr. Pinter to explain. Mr. Pinter said that the requirement of state law is to provide a report. The council would have to override a negative Planning Commission recommendation by a 2/3 vote. Mr. Seabury said that he didn't ever remember going against a Planning recommendation. 3rd Ward Councilmen Caladrino and Cavo's action exposes the fact that the Republicans on the council were moving forward with approving this deal plain and simple...what really happened is that there was a Republican absent which screwed the 2/3 majority needed to get this land deal passed. Once they knew that they didn't have ONE Democrat on board with the deal, the Republicans bailed out on the whole thing and left Knapp (whose a freshman) out to dry. Does this give Knapp a pass? NO. He was the former chair of Zoning and should have had the foresight to simply extend the ad-hoc committee until more information was available (i.e. hearing testimony from Public Works and Traffic) as well as asking himself whether or not there were any opposition from the neighborhood towards this deal (and YES there is PLENTY of opposition from neighbors towards this deal as they've spoken up against this and other attempts to develop that stretch of road on Hospital Ave in the past (again the property is in the 3RD WARD, Caladrino's ward). Whatever the case, although Knapp (and DEFINITELY Majority Leader Seabury) votes are bizarre, 3rd Ward Councilmen Cavo and Caladrino's vote to APPROVE THE REPORT makes absolutely NO SENSE given that they turned around and voted against the deal....unless their true intentions WAS THE APPROVE the deal (which definitely AND WITHOUT QUESTION would go against the majority of residents who live on Hospital Ave.) until they realized that they didn't have to votes to make it happen. Oh...did I mention that the neighborhood (who has been opposed to any further development on that stretch of Hospital Ave) had NO IDEA about the land deal because they weren't notified by the city? No heads up from 3rd Ward Councilman Cavo. No heads up from 3rd Ward Councilman Caladrino. This brings back memories of the Terrywile land swap which brought about the bill by State Rep Joe Taborsak that requires any municipality to hold a public hearing whenever the city sells off city owned land (the case of Hospital Ave is different because of a land license loophole in Taborsak's bill that someone at City Hall found out). UPDATE: Silly me, in m haste, I forgot to mention that Joe Cavo is ALSO a Councilman who is SUPPOSE to represent the 3rd Ward. The post has been updated to reflect that fact. In order to leave a comment, you MUST enter a VALID email address and username. Without those two items, you get no dice. 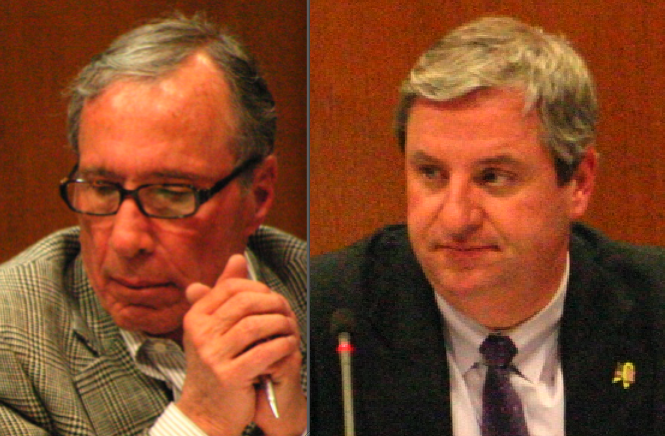 At-large Republican councilmen Gregg Seabury and Jack Knapp were thrown under the bus for making what will go down as the weirdest vote in recent memory. One person is a teacher. The other is the former chairman of the Zoning Commission. Together, they make complete fools of themselves in voting in favor of a obvious idiotic land deal between the City of Danbury and a doctor who wants to take city-owned land and use it for PARKING SPACES for his office. 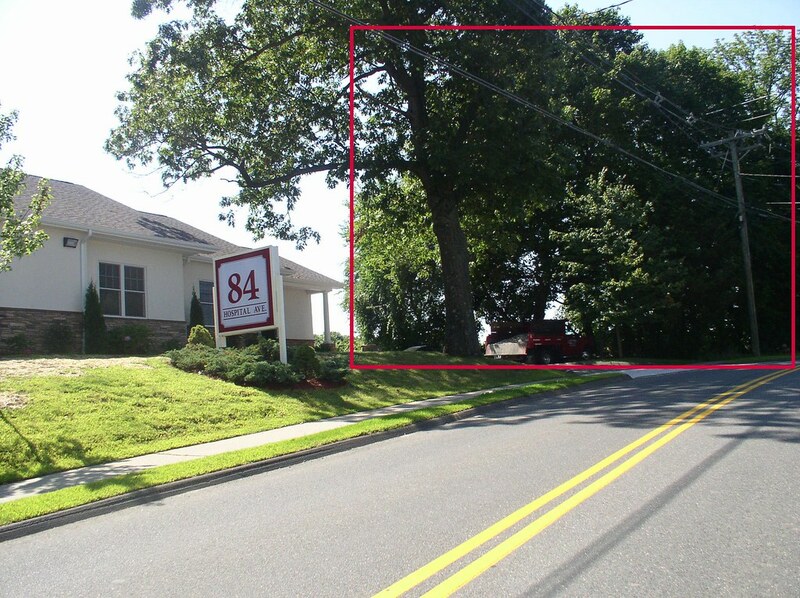 Dr. Fry has a practice on 84 Hospital Avenue and for some time, has attempted to acquire the land next to his property for additional parking. There's one problem, that land is city owned land and is connected to Broadview Middle School. For as long as I can remember, people have long stated that Dr. Fry knew what he was getting into when he moved into that location and should move instead of tearing down trees for parking spaces. Why? Because the parking lots that are there now conforms to the zoning regulations for the property and if the doctor's business needs more parking, maybe the doctor should consider moving his practice instead of asking the city to accommodate his practice. If the council would EVER approve such a deal, that strictly accommodate ONE business and ONE business only, the effects of that decision could be devastating as the Common Council would set a president where anyone in a similar situation as Dr. Fry, could come before the city looking for the same deal (you could see the problem that would create as the city would have a rather hard time turning one business down once they approved this deal). Now, taking that into consideration, let's take a look at the bizarre vote from the former chairman of a land-use board and a TEACHER. 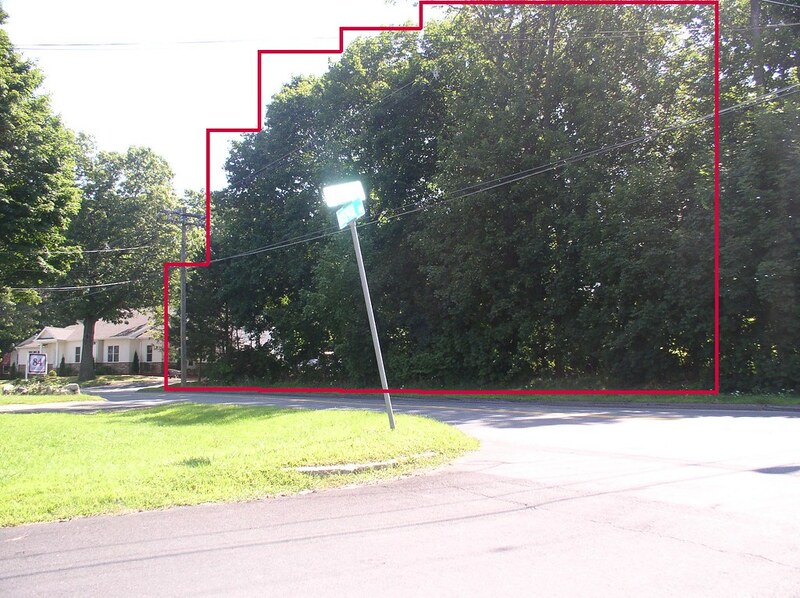 Mr. Iadarola said that the property abuts the Broadview Middle School property. 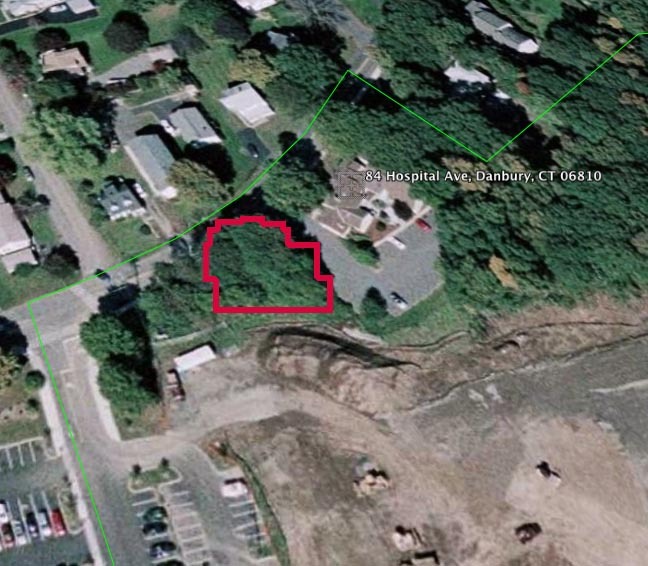 The heavily wooded property is 18 feet by 150 feet, and would have a fence that could be mutually accessible. Public Works has no negative referral, but would like Traffic and Public Works to review it. Mr. Seabury moved to recommend to the Council to approve the license agreement with active input from the Director of Public Works and Traffic Engineer. Mr. Knapp seconded the motion. The motion passed unanimously. Mr. Seabury moved to adjourn the meeting at 7:35pm. Seconded by Mr. Knapp. The motion passed unanimously. 1. The PLANNING DEPARTMENT report on the "leasing" of the land to Dr. Fry a BIG FAT negative. 2. This is not the first time Dr. Fry has tried to acquire this land from the city with no success. 3. 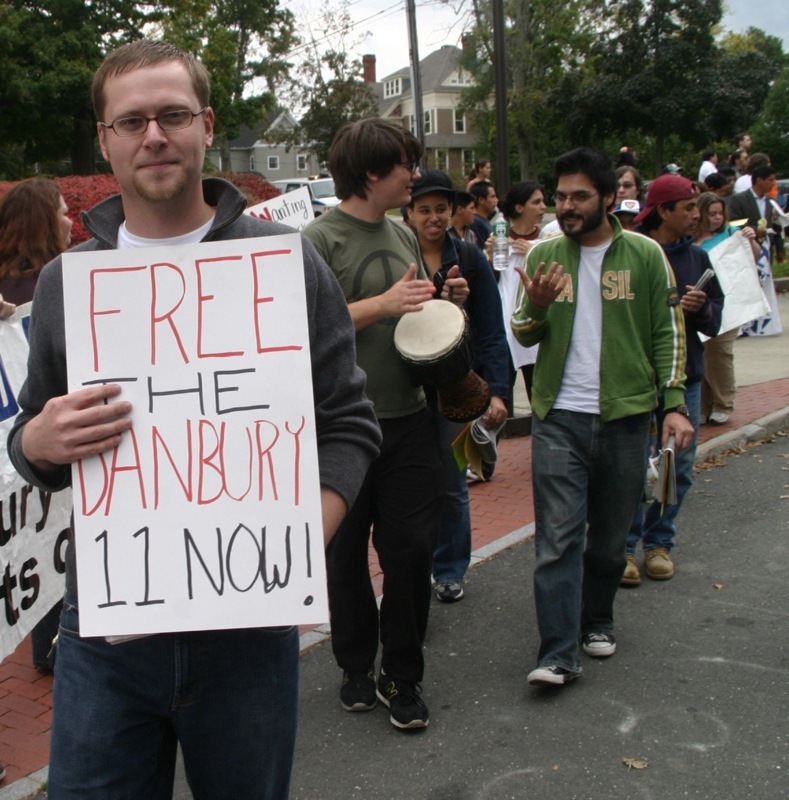 ALTHOUGH Seabury (a TEACHER) stated that he COULD NEVER REMEMBER GOING AGAINST THE PLANNING DEPARTMENT'S RECOMMENDATION, (you know, since the Planning Department would know a bit more about land-use issues than people on the COMMON COUNCIL), he VOTED AGAINST THE PLANNING DEPARTMENT REPORT and in FAVOR of the so-called "lease" agreement. 4. A former chairman of the Zoning Department (a land-use board) went AGAINST THE REPORT FROM THE PLANNING DEPARTMENT and WITHOUT INPUT from the Board of Education or input from the neighbors in the area WHO WERE MOSTLY UNAWARE OF THE LAND DEAL and many (once notified of the land deal) were AGAINST THE IDEA, VOTED AGAINST THE PLANNING DEPARTMENT REPORT and in FAVOR of the so-called "lease" agreement. Seeing the writing on the wall, knowing that approving this agreement would create a firestorm in the neighborhood, and NOT ONE Democrat would go for something so outlandish as to approve this nightmare, the other Republicans on the council thought twice before falling on Knapp and Seabury's sword. Now, with that in mind, sit back and watch what I call the Republican majority throwing the new kid (AND FORMER CHAIRMAN OF THE ZONING COMMISSION) and teacher UNDER THE BUS. Take note of how the mayor tried in vain to persuade the council to send the whole thing back to committee. ...why on earth would a former chair of a land-use board and a teacher ever approve of this land deal in the first place? When the city is so-called attempting to acquire a certain amount of open space before a set date, why are we trying to GIVE AWAY land and tearing down trees in order to give a doctor a few more parking spaces? What were Knapp and Seabury thinking?!? 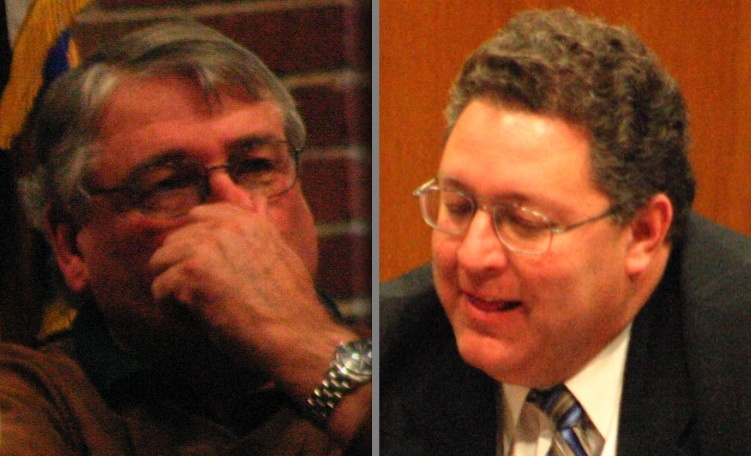 UPDATE: The News-Times wonders what Knapp and Seabury were thinking also. Two words: Thumbs down.